Our workshop in Varanasi has been designed for the people interested in photography, travel and culture of India. Basic knowledge of camera is essential. You may carry a basic point and shoot camera or DSLR. 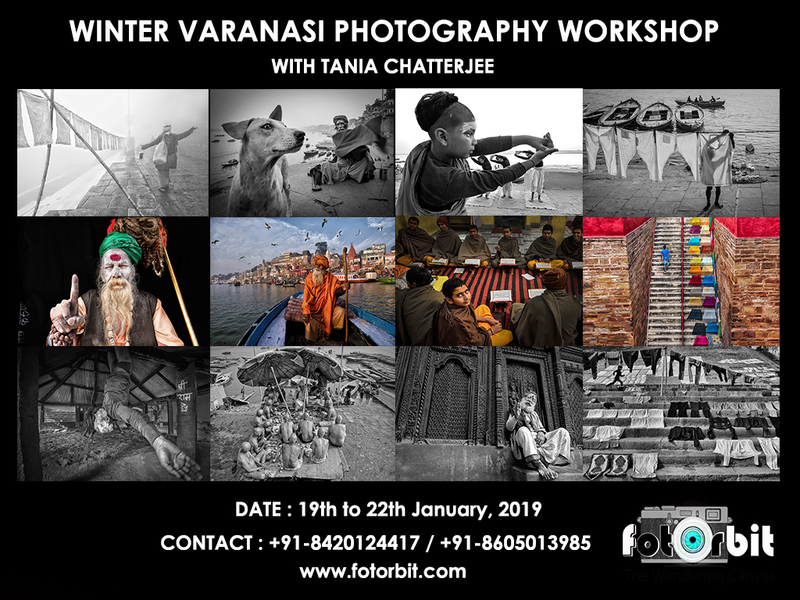 We will help our guests in on-field camera settings, framing and post processing, if that’s what is your requirement then surely join us for this exciting winter Varanasi photo tour with Fotorbit. We are not offering a package tour for general tourists; it is specifically meant for photography enthusiastic people and interested to exploring the oldest city of India. You will discover the place and learn a lot about this ancient city, local people and their culture which is important part of our travel photography. We will try to observe the local people, their daily activities and cultural beliefs and will try to capture those moments using right compositions and techniques. There is a strong belief within us that travelling is all about knowing others’ cultural beliefs and respecting them. 19th Jan, 2019 (Saturday) : Check – in to our pre-booked Hotel around 12 noon (standard hotel with clean room and western toilet). Have your lunch and settle down. Evening we will have a discussion session on people and street photography of Varanasi. Start Photo walk with our mentor at evening ( explore evening aarti at Dashashwamedh Ghat) . 20th Jan, 2019 (Sunday) : Today will start at 5.30 am with morning aarti at Assi Ghat , then catch various morning activities along side of the river ghats. After breakfast explore the lanes of Varanasi. Back to hotel around 11am. Get fresh and have your lunch. Evening walk will start around 4pm. Today experience Nepali temple and Manikarnika Ghat, which is one of the holiest ghats among the sacred riverfronts, alongside the river. It is believed that a dead human’s soul finds salvation, when cremated here. After returning back, we will have a review session of images. 21st Jan, 2019 (Monday) : Today our morning session will start around 5.30 am and we will try to discover the Ghats of Varanasi on boat. Boating in the Ganges at the sunrise is one of the main attractions of Varanasi. You will able to shoot landscape of Varanasi in fog and with migratory birds. Later explore the lanes of Varanasi for street photography. In the evening session, we will be on the Ghats again to shoot the evening Aarti in different angle. 22nd Jan, 2019 (Tuesday): Today we will try to photograph something different in Varanasi like the famous Kushti Akhara (wrestlers) and Lolark kund (step well of Varanasi). Return to your hotel after breakfast around 10 am and 12noon is your check out time. After lunch, we will end our trip. The total cost for this tour is Rs. 12,500/- per person (Indian participants )/ $300 (foreign / NRI participants). To book your place, you are required to pay the entire fee before the tour. Fee will cover all meals (breakfast, lunch and dinner) starting from Day 1 (19th Jan, 2019) lunch to Day 4 (22nd Jan, 2019 ) lunch. Mineral water will be served only with meals. All local transports in and around Varanasi related with our photo tour. On field assistances, image reviews and mentor’s guidance fee. Pick up and drop to and from Varanasi station or airport to hotel. Greater than 60 days from the start date of the Workshop: full refund minus service tax. FOTORBIT do not have any insurance policy covering the expenses for accident, sickness, loss due to theft, or any other reasons. All baggages, camera, other gears & personal property/s at all times are at the client’s risk. I’m interested in this workshop. Can I have more details regarding mode of payments etc.